gathering, organization, preparation, Squirrel, squirrel medicine, squirrel totem, what does squirrel mean? This little gardner does not concern herself with how large the world is. She measures the span of her realm nut by nut. It is not necessary to travel far and wide in search of what is needed. We need only dig and uncover all the hard work we’ve already put into the ground. Nothing undoes the work we do. Failure is only a mental perspective that can, in an instant, be reframed as practice towards excellence. Squirrel puts her whole body into the storing of resources. If her medicine is visiting, it is time to clean house and stock up for a rainy day. She knows that without organization nothing can be done well. This high energy medicine teaches how to anticipate the challenges ahead as well as how to live simply without a fear of lack. She is a fast, spry energy that can zip through a room and have it’s contents alphabetized before the tea kettle whistles. Her claws help her leverage her body in all directions and she can clock the length of a tree in seconds flat. One tree is all the world Squirrel needs, as it contains all reaches of the cosmos from root to seed. When a person is visited by Squirrel medicine, nothing can get in their way as they pursue their goals. 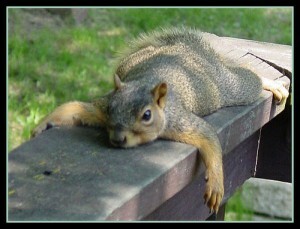 Trying to talk to a person when they are in ‘nut-gathering’ mode can make you dizzy. They will be up and down the stairs, out the back, and through the kitchen before you finish your sentence. Following them around and trying to track their logic at such times will confound you. Best to give them space and let them get organized. There is a limit to how much one person can help another person. In the end, it is the individual who will complete the process into clarity. Lingering about and trying to help beyond capacity can cause distractions for both parties. Squirrel suggest that we give a difficult issue to the field and let the buried nuts beyond our immediate understanding open new solutions. 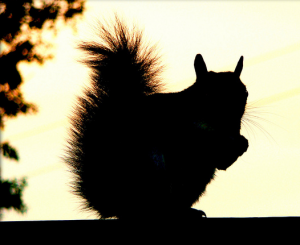 Squirrels are as sane as their ability to compartmentalize life’s confusion. Her medicine warns to not let misunderstandings build up between people or situations. Take the initiative to clarify an issue but let the issue go if resolution is not immediate. Letting something go does not mean you can never return. Letting something go is not an act of weakness. Space is needed for growth to occur. This medicine knows when to fixate and when to scatter our attention to give new discoveries room to arrive. Conversations at parties are an excellent example of Squirrel medicine in action. We move from group to group, and topic to topic, tossing seeds in all directions. We have no idea what we might say next or which chemistries might grow tree sized. Squirrel’s energy explores the surface of personal dynamics with others rather than the more serious depths that come with intimacy. This medicine is also a good teacher in how to dress with an easy, comfortable fashion. Call on Squirrel medicine to find the style of clothing that expresses your inner life perfectly in any situation. Never over dressed and never underdressed, Squirrels tail is the envy of the forest. Like a network of highly charged fiber optics, her tail is her most expressive attribute. She communicates her passions and irritations with riveting flicks and shakes. She is a dancer who celebrates every nut well buried. Her medicine asks us to take time to celebrate a job well-done with a little squirrel dance in the woods. Wiggle and shake for a moment every day. Find time to connect to the joys of small accomplishments.